Only 5 days till Spring ! Whoever said that does not live in Atlantic Canada ! Our regular March meeting will be held on March 23, 2015 7:00pm at Windermere Hall in Berwick. 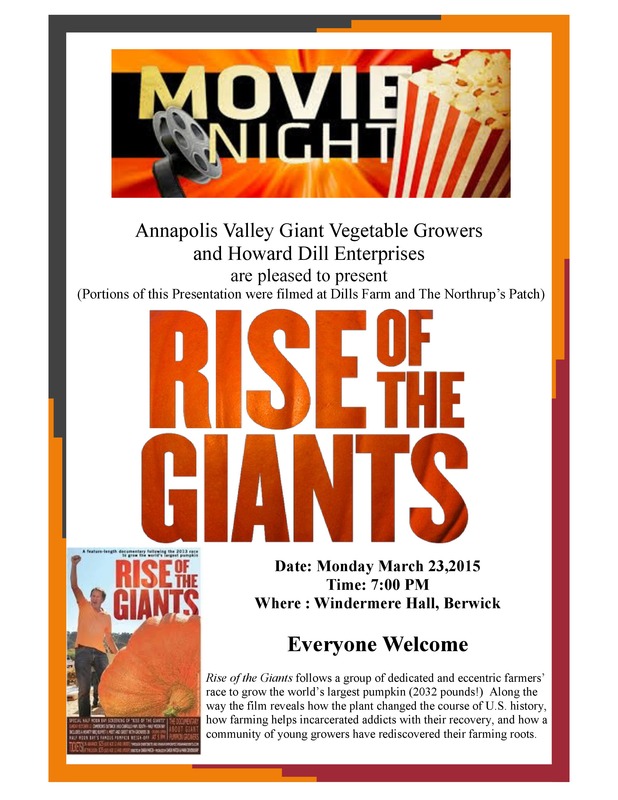 This meeting we will have a special presentation called “Rise of the Giants”. This film follows various Giant Pumpkin Growers (including the Dill’s and Northrup’s) through their various trials and tribulations. We encourage you to bring anyone who might have an interest in Giant Pumpkin growing. Thanks to the Dill’s for donating this presentation to the club. See attached document for details. If anyone has seeds to exchange with other members please bring them to the meeting to pass around. Our April and May meetings will be combined and held in May. This will be our annual plant exchange so why not start a few extra plants to exchange with club members. If you are growing some of the other vegetables in the 2015 seed pack , the information on carrots, radish, onions, cabbage, corn and beets has been put on the home page of our web site www.avgvg.com.